Welcome to the MRC Wood Products! 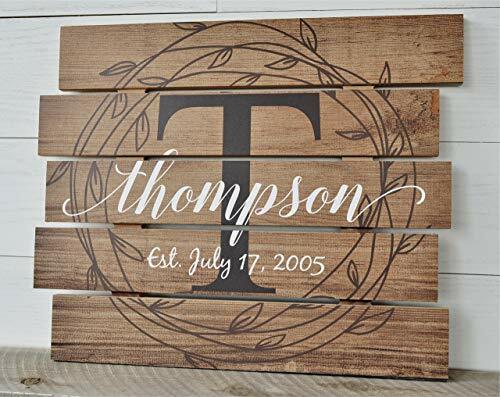 We make custom family name signs and prints that are on the leading edge of both design and materials. For instance, the item in this listing is made with MDF which is made to look like individual planks. Your information is printed directly onto the wood. There is no paper or vinyl to peel off. Be the first among your friends and family to have a unique and sure-to-be heirloom photo. ***ABOUT THIS ITEM*** This is a brand new item for our shop. It is a personalized print that we print directly onto the wood, creating a very unique and timely look. We use state of the art technology to take your information and monogram and print it on the wood which makes for a durable heirloom. The sign measures 15x18 and will have a slot on the back so it can be hung on the wall. If you have any questions about this product by MRC Wood Products, contact us by completing and submitting the form below. If you are looking for a specif part number, please include it with your message.